Learn to Create a Small Business Website for your Affiliate Marketing Business. Every business online should have a website for their online presence and it’s doesn’t take you more than 10minutes to create a small business website for your company. In this digital world of fastest economics, if you don’t have a website, you may be losing your potential customers. A Website is your digital home where you can showcase your products and services so that people can visit your website to know about your stuff. You can easily reach the Global market place with a website. Let us learn how to create a small business website for your current business and reach out to the potential customers out there in this world. I have detailly listed FIVE important steps to proceed in creating your website for the people. When you ask any entrepreneur whether they have started their first business after figured out all, they will laugh and say absolutely no. The only thing they had is their passion and interest to start a business. It does not require to be knowledgeable before starting any business online. Start with the right perspective and strong opinion on positive attitudes because if you think it’s not possible to complete, then you won’t. When I completed my Engineering studies, many of my college mates have attended campus placement and went to work for some company. But I decided to choose to blog and to become an entrepreneur, luckily, I have achieved my position after a year. This is the very first step in starting your first online business. Your website name tells your business nature and the products or services you are going to offer. I decided to start an affiliate marketing business with a blog. Choosing a right domain name is like naming a baby. It should be fit and perfect, it could be easily findable over the Internet. I thought a lot to come up with this name Easy Online Home Jobs. Be careful in choosing the domain name as it does not include hyphens, capital letters, common words such as, “a”, “the” etc. Once you have chosen the right domain name, the next step is to figure out the right hosting for your business. All the business should have an online presence and if you don’t have one website, then it fails you will lose potential customers. As no one is interested to lose those valuable customers, it is therefore required to buy own domain today. The cost of purchasing own domain and hosting will not burn your hands. In this article, let me explain you the process of creating a small business website with Bluehost for just $2.95 / month. Easy Online Home Jobs recommend Bluehost because this is the best hosting company for beginners. You will get a free domain name, hosting plans and a professional business email all just for $2.95/month. Do you think this is a gift, of course, yes? Let me explain you the process of creating a small business website for your blogging business. The first step is just to press the button “Get started now” button on the page you are watching. 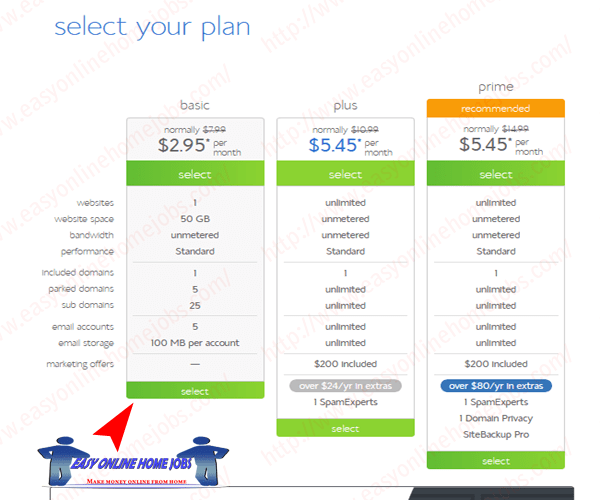 Then, you can able to see three different types of hosting plans, among them, I recommend you to start with Basic Plan ($2.99/month). The other two plans are really great, but it is not required at your beginning. This is the next step in this process. You have to be very careful in choosing your domain name because you can’t change this in future. Check for the right domain name availability in the domain search tools provided by Bluehost. 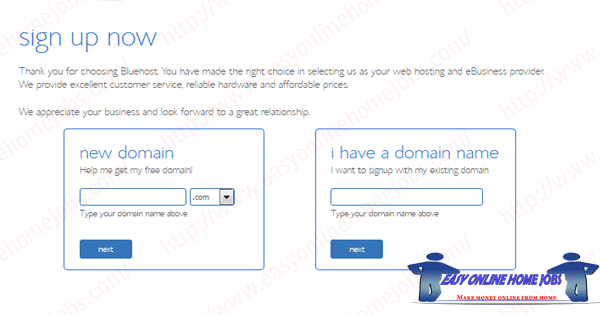 The domain example: easyonlinehomejobs.com (no capital letters, no spaces, no special characters). Once the domain is available you will be taken to the registration process, else you will be given some few other suggestions or alternatives. Choose only .COM version of the domain name for your business, because online business is open always open to the world market. If you already have a domain name, just enter it in the next column and press “Next” to move further. Now, complete the registration form by entering your personal information to create an account for you. 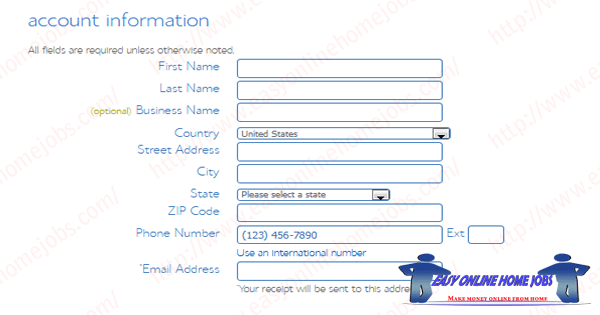 You will need to add First Name, Last Name, Country, Street Address, City, State, Zip Code, Phone number and Email address. All your communications will be made through this email and/or phone, so give only true information. The next step is to choose your plan and package. This is the last step in your account creation and registration. Pay close attention to all the products listed here like Domain privacy protection, Site backup pro, Search Engine Jumpstart, SiteLock Security, Comodo Positive SSL Bundle etc. Now complete your payment by entering your credit card/debit card details. Once you paid, you will be able to create a password for your account. With the Introduction of the Word Press Content Management System, creating a blog becomes much easier than others. There is no need of having special skills and abilities to design a website or a blog. 3.1.) Login to your hosting account. 3.2.) Go to your hosting control panel. 3.3.) Look for the “Website” section and inside you will find the link/Icon “WordPress”. 3.4.) Click the Icon to install the WordPress on your domain. 3.5.) Choose the best theme suitable for your business. Shared Hosting: This is the most affordable hosting plan suitable for typical newbie bloggers limited to one single domain with less or no traffic. This hosting comes with some restrictive features such as limited server resources, data usage, and other features. It will not support you for a long run or once your blog/website starts receiving thousands of visitors. Virtual Private Server: This is called as the Virtual Dedicated server where the resources are isolated and dedicated to a particular blog/website. A big server is separated into the small virtual server with their own dedicated RAM, CPU, Processors to power your business website. The cost expense is medium when compared to a dedicated server, but you can enjoy all the features of the dedicated server. Dedicated Server: This is very costlier because you are going to purchase your own dedicated server. When your business website or blog experience a large growth on the individual plan, you should upgrade to the dedicated server. However, the above-recommended hosting is enough to create your small business website at your beginning. After completing the purchase of domain and the hosting, you probably needed to install WordPress themes. After that, create a blog layout for your business. You can do it either by yourself or hire a professional to perform this action on behalf you. Choosing the best domain name and the perfect hosting is not enough to achieve success in the business. All the information about the company, product or service should be presented well in sequence. There is no need to worry about this part because most WordPress CMS themes come with predesigned templates suitable for various business needs. Hence, it is very easy to create a small business website in just a few minutes. The CMS has GUI interface which makes easier to create new pages and create new blog posts. What pages you needed to create for your business website depends on the specific industry. Carefully choose the pages and prepare a hierarchy for your website to provide better user experience and friendly navigation. The logo is a trademark symbol of the brand website or business, that helps to identify websites easily. You can see all the websites have a logo and they use to mention everywhere they advertise their brand. So, after creating the layout and website structure, design a logo to create a brand in the market. If you are an expert in Photoshop designing or having knowledge in some designing software’s, you can create a logo of your own. The second option is to find the right person in the Fiverr website to offer the service you are expecting for. You can hire a person from $5 for designing a logo. This is the last process of creating a small business website as you have arranged all single pieces ready to put them all together. A study shows that the website/blog has only 3seconds to pull the visitor or they may leave very soon once they hit your website. So creating a nice and good looking website is an important aspect that determines the success of your business. So what are the important factors to consider in designing the website? 5.1.) Clear Cut Navigation: You want your site visitor to know the service or product you offer instantly. They should be guided properly where to go and learn about you and your company, the various products offer or contact any representative etc. If the navigation is not clear, then the visitor may leave the site earlier and they will never come back. 5.2.) Use Call to Action Buttons: If your sole purpose is to convert your site visitors into your customers, then you should lead them to the sales page, lead page or landing page as soon as possible. Creating and implementing a clear call to action button attract the visitor’s eye and help them to take the expected action. 5.3.) Make your site faster: As said earlier, your site needs to be fast enough to render all the information in the browser. Even a fraction of a second too long will negatively impact your site SEO and people often leave quickly. So make you sure choose the right hosting company for your business (I recommend BlueHost). 5.4.) Make your site responsive: Google study shows more than 80% of the site visitors are from Smartphones and mobile phones. Hence create a responsive site to fit all different screen sizes to grab more customers. Google recently announced a change in their ranking algorithm. The site which is highly responsive tends to rank better in the search results. 5.5.) KISS (Keep It Simple Stupid): Don’t overdo with the design and use many colors to tell what you actually want to see. Most people often feel annoying and leave your site often sooner. Keep the information precise and simple on every square inch. Allow more white spaces for legible reading and focus attention on the subject matter. When you prepare to launch a new business, do not forget to create a small business website/blog for your business. The Internet is everywhere and all the traditional business have elevated their online presence with a website. Consider the user experience and write content for the users without stuffing keywords. Concentrate on delivering quality content, rather just focusing on money. Thanks for reading this article. Creating a website may be a daunting process, but if you have the true interest and the focus, it may then look great. EasyOnlineHomeJobs was started to teach Affiliate Marketing Business with a blog. I am currently making my full-time income from this blog and hope you too have curiousness to know more about this. If all the process you read above looks difficult, then I can show you the easy way. Yes, I will support you create a blog by registering own domain and hosting, get your blog designed well and ready for Affiliate Business. All these processes come up with a very affordable price of just $120. If you wish to start working with Easy Online Home Jobs, comment here in this article.